The Donair. A relatively easy food to find in Vancouver. Sometimes, it is the only late night option in Downtown. However, other than Surrey, you won't find too many of these joints in the burbs. Imagine my utter confusion when a new donair spot opened up in Port Moody. Get this, it wasn't even in the heart of the action. In fact, it is at the top of Clarke Road hill where there are very few businesses. The only other place that even catches anyone attention is KY Market. Insert joke here. Anyways, the reason I know about Ben Laila Donair is because I drive by it daily. Where Pomegranate is busy looking at women, I'm in search of new restaurants. Imagine the humour of the moment when I snapped my head towards the right when I was driving. He thought there were some pretty females around. No, no females. A restaurant! Ah yes, I had spotted a new restaurant! Check it out! So weeks passed. 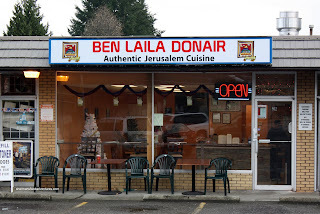 Eventually even months passed and I would drive past Ben Laila. Finally, we decided to stop and try it out. Initially, I had a hard time deciding what to have. Beef? Chicken? Lamb? The friendly owner decided to offer some sam ples of each. They were all pretty good. 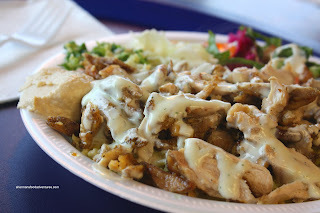 I eventually went for the Chicken Platter with rice, salad, hummus, tahini and tzatziki. The chicken was tender, although it could've used a bit more flavour such as the one at Al Basha. I really liked the accompanying salads. They included Red Cabbage, White Cabbage, Hot Carrot, Tabbouleh and Arabic Salad. All were very vibrant and fresh. 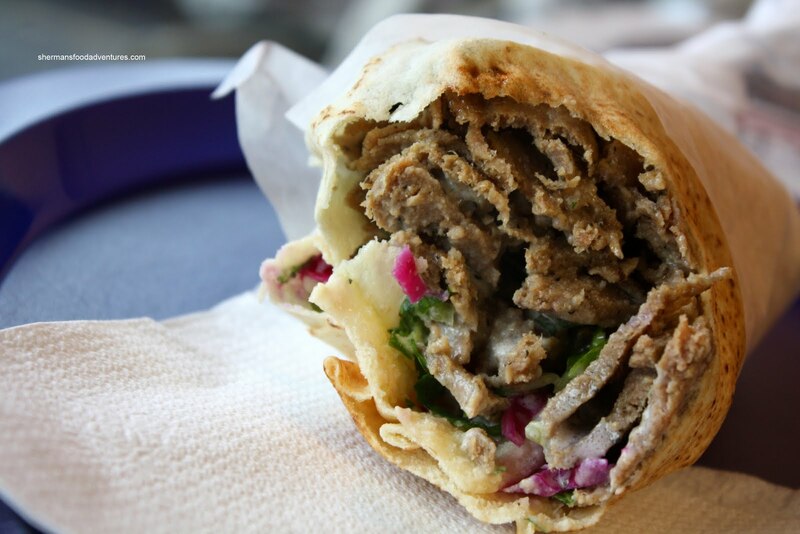 Pomegranate got the Lamb Donair with extra meat. As you can see, there was a lot of filling. From what I sampled, the lamb was moist and flavouful. The donair itself could've used a bit more condiments to up the flavour intensity. 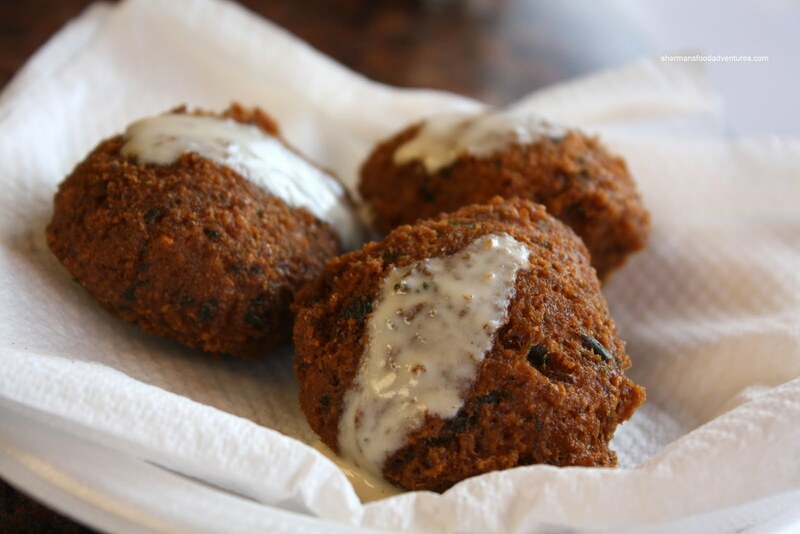 Lastly, we got some Falafels to try. I'm not a huge fan of falafels (probably since I'm a big meat-eater); but these were fantastic. At first, they didn't appear fluffy. However, one bite past the crispy exterior, it was fluffy and flavourful. I could sit down and eat these with a cool one. That was a nice end to a pleasant meal. We were surprised to find such a place out here, especially since it was pretty good too. I'm still a bit impartial to Al Basha; yet for something that is a bit closer for me, Ben Laila does the job. That assessment is indeed quite correct: donair/shawarma shops have popped around in Downtown Vancouver in some unconspicious ways. But, hey, they are somewhat cheap and filling so, if that works for people! Cheap and filling is good! Yes, if you are on your way to Cake-Ya, definitely give it a try. Maybe ask for some hot sauce though, needs some kick.